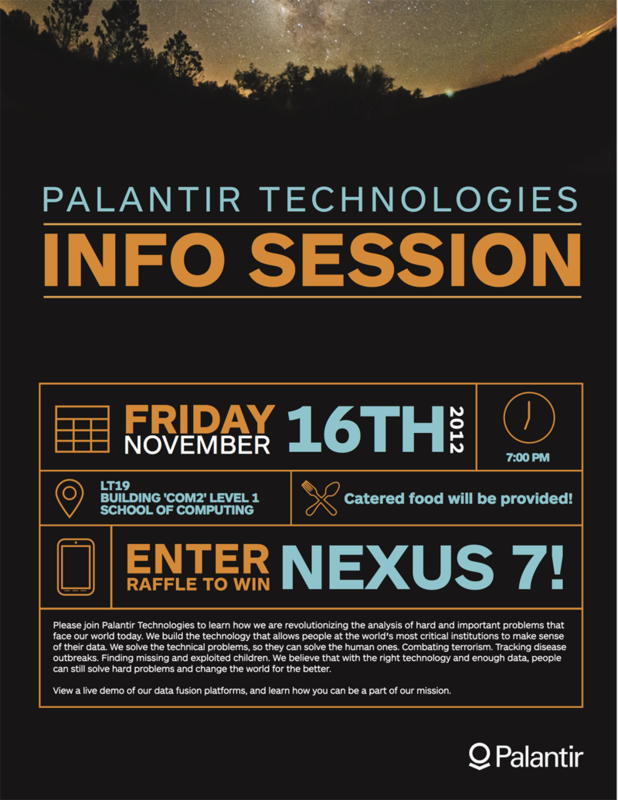 This Friday, Palantir will be coming to NUS to give a recruiting talk. Food will be served after the talk, and a Nexus 7 giveaway will be held for one lucky registrant at the end of the event. “ Please join Kevin Lee, Forward Deployed Engineer at Palantir, who will discuss how Palantir is revolutionizing the analysis of hard and important problems that face our world today. We build the technology that allows people at the world’s most critical institutions to make sense of their data. We solve the technical problems, so they can solve the human ones. Combating terrorism. Tracking disease outbreaks. Finding missing and exploited children. We believe that with the right technology and enough data, people can still solve hard problems and change the world for the better. View a live demo of our data fusion platforms, and learn how you can be a part of our mission. Kevin Lee is a Forward Deployed Engineer who is starting up Palantir’s new Singapore office, which serves as the regional HQ for Asia. He attended Stanford University on a PSC scholarship, graduating in 2006 with a BS in Computer Science with Distinction. He subsequently worked on a wide array of public policy issues as an Administrative Officer in the Prime Minister’s Office and Ministry of Finance, before making a happy return to his technical roots at Palantir to help organizations in the public, private and non-profit sectors solve their hardest and most important problems.